Stuck in the Land of S.A. (a weird version of the Land of Oz), Grunge and Roxy (in the form of a tiny fairy named “Tinker”) stumble across the Teenage Mutant Ninja Turtles buried beneath an enormous pile of their own merchandise. The Turtles beg for Grunge’s help and Roxy encourages him to assist, as the Good Witch told her that the Turtles would help them on their quest to find the Wizard. Grunge, however, simply recognizes the Turtles from his favorite childhood TV show and is psyched at the chance to meet them. Grunge digs Leonardo, Michelangelo, Donatello and Raphael out from the heap of toys, Nintendo cartridges, plush dolls and breakfast cereals then sits down to have a little chat. Grunge asks whatever happened to them and Don and Leo explain that things were going along just fine until they were blindsided by the Frenzy Beast and his Power Ranger minions (ha ha ha). Mike takes it in stride, being happy that they at least got three movies out of the ride before their time in the spotlight expired. Raph sighs and says that all they really want to be are comic book heroes again like back in the old days. Grateful for his help, the Turtles offer to do anything they can in return. Grunge wants to find the Valley of the Dolls, but Roxy slaps him back into focus, and he asks if they know where to find the Wizard. The Turtles tell them to simply follow the Frenzy Beast’s path of destruction (a huge trail dug into the landscape), as the Wizard has been tailing the fiend for some time. Grunge and Roxy wave goodbye to their new friends and head after the Beast. *Due to the surreal and self-aware nature of this story, I wouldn’t consider it canonical to any of the Turtles’ adventures. *Gen 13 (Vol. 2) #13A, #13B and #13C are three completely unique issues that tell a single story arc rather than simply being the same issue with three variant covers (as the #+A, #+B, #+C designations typically imply in comics). *My summary only covers the Turtles’ appearance at the beginning of the issue. Afterward, Grunge and Roxy also encounter characters from Jeff Smith’s Bone, Mike Allred’s Madman, Larry Marder’s Mr. Spook, Erik Larsen’s Savage Dragon and Todd McFarlane’s Spawn. Additionally, they also encounter parodies of Marvel’s Hulk, DC’s Wonder Woman and Rob Liefeld’s Youngblood. Coinciding with the publication of Image’s TMNT (Vol. 3) series, Image did their level best to shoehorn the Turtles into as many of their publications as conceivably possible. While their one-panel cameos in books such as Shattered Image #2 and Mars Attacks Image #1 were positively inane and obnoxious, their two-page guest spot in Gen 13 (Vol. 2) #13B was actually remarkably amusing. I never got into Gen 13 when it came out back in the day, and I’m still not much of a fan, but the title from what I’ve read has a consistently goofy and irreverent nature that makes it a fun read when I’m in the mood for something that oozes 90s and isn’t out-and-out terrible (and believe me, finding something 90s that isn’t out-and-out terrible is slim pickings). This particular story was a fun romp through self-awareness and “subtle” jabs at the comics industry of the day. 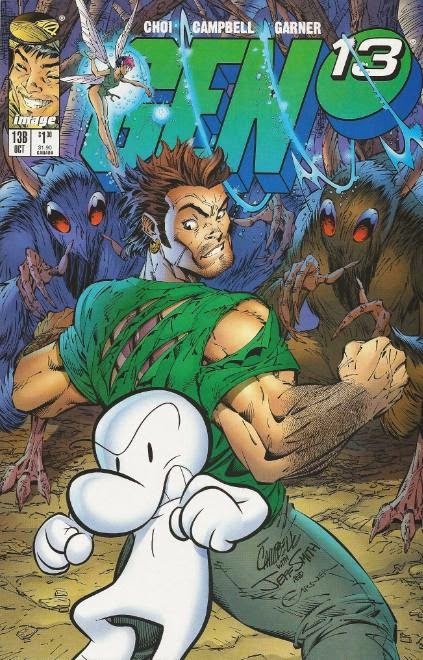 Grunge’s further journey takes him through places such as “Image Town”, where he glimpses Dragon tossing thinly-veiled approximations of the Hulk and Wonder Woman out of “The Highbrow Club” for “not having a sense of humor”, and most hilariously of all, past the dilapidated Top Cow barn to the boarded up “Bloodquarters” where some very obvious parodies of Rob Liefeld’s Young Blood are being evicted and left destitute. I’m glad I put “subtle” in parenthesis because they straight up address the current status quo of the Image characters in the comic book industry, the rapid deterioration of the so-called Image “universe” and the mass-evacuation of the publisher’s fanbase. Then there’s the “Frenzy Beast”, who brings upon destruction to any character experiencing a string of success. It reminded me a bit of issue #10 of McFarlane’s Spawn series, the one with Cerebus. However, the writing for this self-aware satire was actually clever and amusing and not just 20+ pages of uninspired metaphor that thinks its deeper than it really is followed by a string of tasteless jabs at corporate comics and freelance creators. As for the Turtles, I got a good chuckle out of their bit in this whole shebang. The cameo had a smidgen more relevance at the time of publication (as did this entire storyarc, which seems rather “quaint” fifteen years later), but it’s good to see them cracking wise at themselves. The Turtles will likely never regain the "Indie Cred" they had between 1984 and 1987, and the Image series certainly felt like it was trying way too hard to do so, what with all the gore, thongs and gratuitous swearing, but I’m sure they’ll never stop trying (and I’ll never stop laughing at all the fans wondering why we haven’t gotten a rated-R TMNT feature film yet). J. Scott Campbell is a very popular artist… but then, so was Rob Liefeld. I’ve never been a fan of Campbell’s, as he tends to employ the “same face” method of art I find utterly repulsive. All his characters feature identical countenances: Jack Nicholson eyebrows, wrinkled noses and cold, dead eyes. And why does he give EVERYONE freckles? Even the Turtles have freckles! Still, he has a good handle on dramatic layouts and action staging, so while everyone looks terrible, they’re at least in dynamic poses. 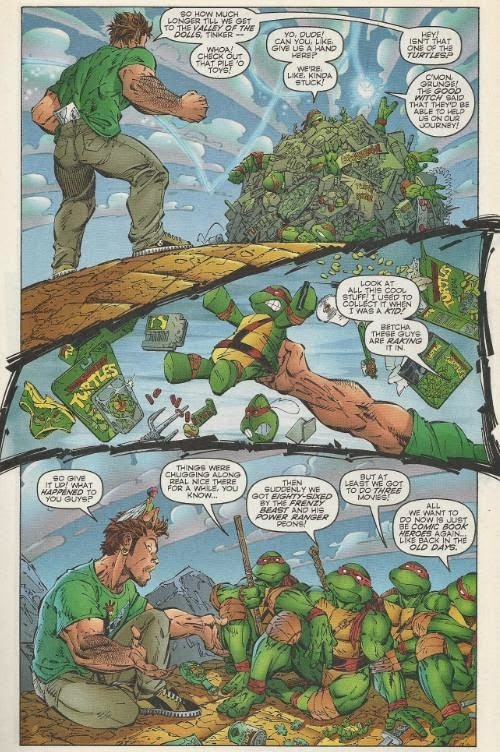 Overall, this is one of the more amusing and creative uses of the Turtles by Image at a time when they didn’t know what the Hell to do with them outside of their own (barely selling) series. However, as the Turtles only appear for two pages, it’s more a thing for serious collectors out to snag their every measly appearance. From what I've glazed from the Gen 13 ABC, it seems like a really fun (not mention funny) and lighthearted romp through the comics landscape of the 1990s. The very last page honestly makes me feel a bit warm and fuzzy inside. And if definitely ain't part of the Mirage/Image continuity, as most of it is a dream one of the characters has. And the character only dreams about TMNT since bought their merchandise, so I guess this didn't happen in the same continuitie(s) as the Mars Attacks Image and Shattered Image, which depicted both Gen 13 and the TMNT as real. I'd honestly wholeheartedly recommend this arc (either the individual issues, or the collected editions: One which is a TPB with bonus commentary from the creators of the guest characters, including Eastman, and the other is the Jim Lee Tribute edition, which Wizard magazine help put out and is stapled like a standard comic book and has no extras; you you mention this in the review) to anyone who likes any characters featured (when you everyone from Archie to Spawn and even a cameo by Wolverine, you know you've got something special) and you've got a good sense of humor. It's funny that there were quite a few big crossovers between independent comic characters in the '90s. Aside from this, there was the normalman/Meagton Man special (which featured everyone from Bone to Scott McCloud and even a subtle nod to the Donald Duck/Scrooge McDuck Universe), Shi/Cyblade: The Battle for the Independents (which might be of interest to TMNT fans as good old Usagi makes a cameo, as well as Wolff and Byrd of Supernatural Law, who incidentally would much later crossover with the Toxic Avenger, interestingly enough), and the Savage Dragon #41, in which everyone from Hellboy to the TMNT themselves attend the Dragon's wedding (I'd appreciate if you would pretty pretty please review it sooner than later). Hell, there was even a Patty Cake comic that featured cameos by both Gran'ma Ben from Bone and that infamous aardvark known as Cerebus. As well the Savage Dragon/Destroyer Duck special, which featured the TMNT, but peaks my interest for other reasons than the TMNT's inclusion (hint: it has to do with Howard the Duck). Interestingly, there's a new miniseries that had it's first issue come out at the New York ComicCon a few months. It's called War of the Independents and it's another massive creator-owned character crossover. And Cerebus and Usagi are (Bone and even Gumby, too), so, again, fans of the properties that have crossed over regularly with the TMNT might want to check it out. Savage Dragon #41 and Savage Dragon/Destroyer Duck are on the lineup. I went on ebay and bought a whole bunch of comics the Turtles cameoed in last week (thanks in large part to that thread at the Technodrome forum listing them all). Gen 13 was the first to arrive in the mail, but I plan to review em all as they show up (they're quick and easy reviews, too, since the Turtles only make brief appearances). 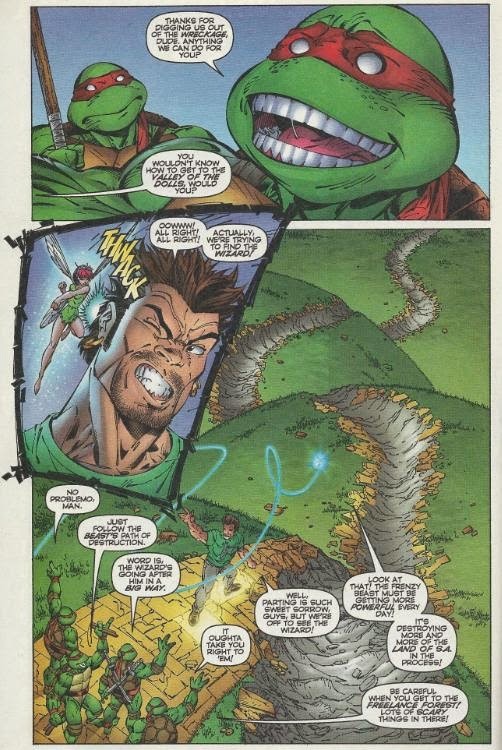 An actual, full fledged crossover between Gen 13 and the TMNT would have been a lot of fun to see, although ironically, the Image versions of the Turtles wouldn't have worked as well there as the Mirage or Archie Turtles.